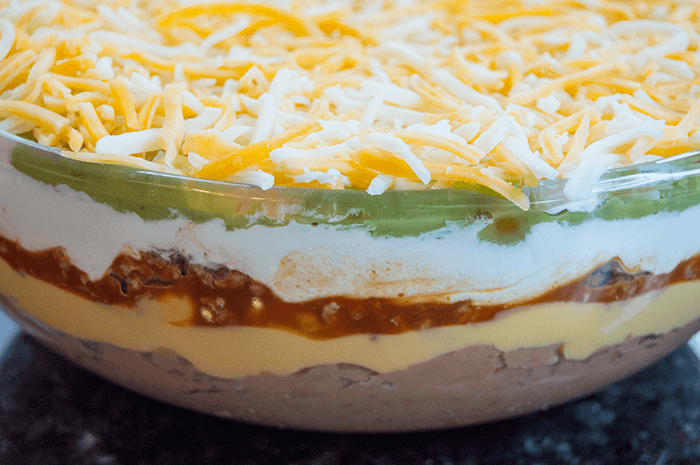 I've made seven layered dips before, but this version was definitely the easiest. Mostly everything comes from a package or can, and the only actual cooking required is browning the meat and chopping the onions. 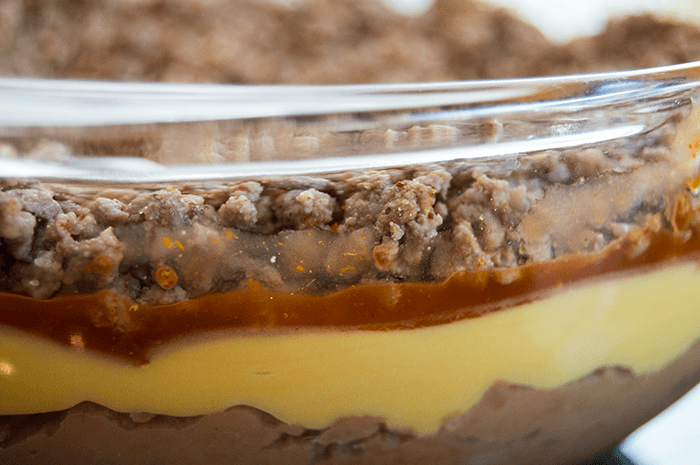 Start by layering the bottom with refried beans. Out of the ingredients used in this recipe, the beans are likely to be the thickest, and heaviest layer, so it's the best to start with. For aesthetic reasons, I used a glass dish so you could really see every layer. I poured on the nacho cheese next, followed by the taco sauce and then the browned hamburger. Next spread the sour cream over the top of the hamburger, followed by the guacamole. It's important that the next layer seals in the guac completely, otherwise you'll have brown guac! I made sure to completely cover every exposed part of the guac with shredded cheese. 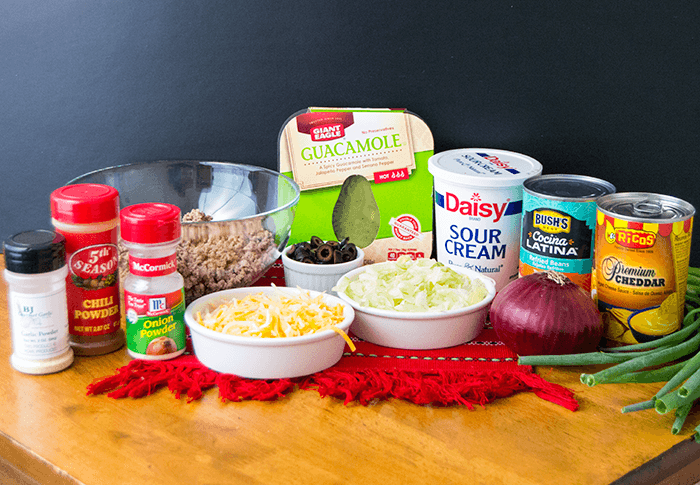 Top the dip with the shredded lettuce, and chopped red and green onions. My boyfriend loves black olives, but a majority of our friends dislike them, so I sparingly garnished the top of the dip with olives. That's totally up to you how pretty you want to make it. 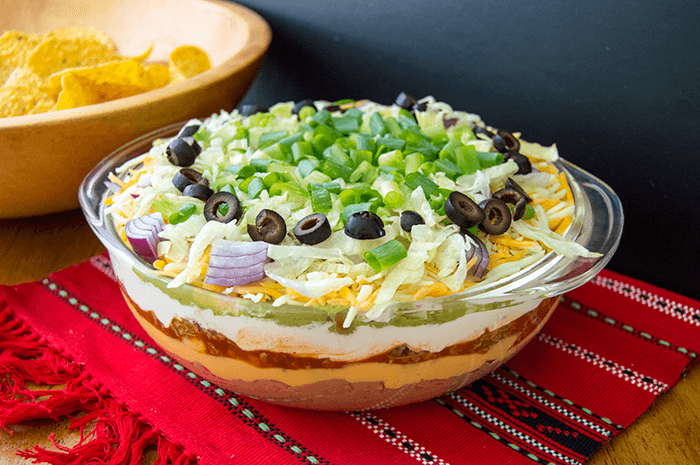 Serve the dip with lots of chips (and veggies too!) and enjoy the game! Cook the hamburger meat until brown and crumbled. Rinse with cold water and let cool completely. Season with the onion powder, garlic powder, chili power, and salt and pepper. 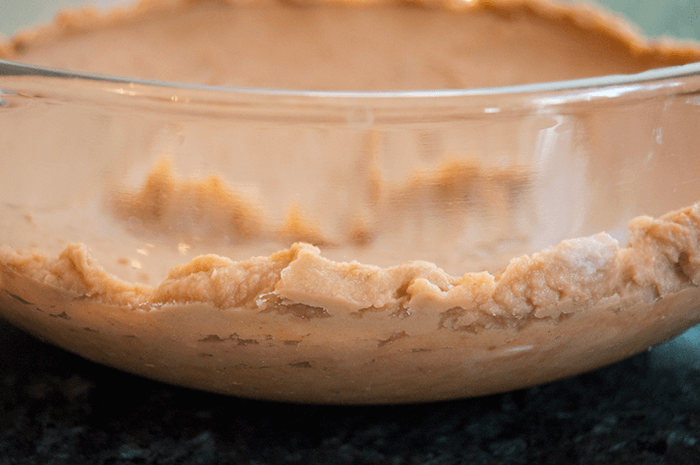 In a glass dish, spread the refried beans in an even half inch layer. Pour the nacho cheese on top, followed by half of the taco sauce. Spread the cooled hamburger on top of the taco sauce, then pour the remaining taco sauce in an even layer on top of the hamburger. Gently spread the sour cream across the top of the hamburger using a spatula, taking care not to lift the hamburger and mix it into the sour cream. Clean the spatula then use it to spread the guacamole in an even layer on the sour cream. Seal in the guacamole with shredded cheese - make sure the guacamole is completely covered so it does not start to brown. Spread the shredded lettuce on top of the cheese. Garnish with black olives, chopped red onion and green onions. Serve with chips, carrots, and celery at your next sporting event. Enjoy!